Air conditioning systems have been available in automobiles since 1939 when Packard first offered it as an option. Before that automobile air conditioning systems were limited to custom applications usually limited to limousines or other specialty vehicles. Today, air conditioning is available in every car or truck and you can hardly find even a used car on a sales lot without air conditioning. In between 1939 and today, air conditioning systems evolved and grew more effective and more efficient. The main change in these systems was what refrigerant was used as the equipment that was installed in the car would have to be designed around that refrigerant’s operating characteristics. Some early systems used ammonia as a refrigerant but in most modern day cars built until 1995, a refrigerant called R12 was used. 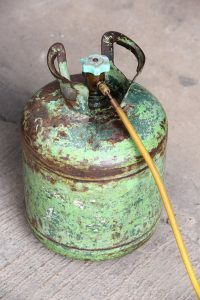 R12 was easily produced and a very effective refrigerant, however, it was later discovered that R12 was an ozone-depleting gas and its production and use became very limited and controlled. This caused the price to skyrocket and companies to find another refrigerant suitable for use in cars and trucks. R134a became the refrigerant of choice after 1995 and still is used in almost every production automobile today. If you’ve got an older vehicle that was originally built with an R12 air conditioning system, you’ve probably experienced the high prices and difficulty in getting R12 to refill your system if you’ve got a leak or need to do maintenance. The good news is, it’s a relatively easy process to convert your system over to use R134a so you can use that readily available refrigerant. To convert R12 to R134a in your system there are only a few small changes you need to make to the system. The compressor that is used in your older R12 system luckily will still work R134a refrigerant and still be just as efficient. The condenser and evaporator are simply heat exchangers so they also do not need to be changed to run a different refrigerant. One component that does need to be changed is the dryer. The dryer is in between your condenser and evaporator and helps make sure all the refrigerant has condensed into a liquid. R134a requires a different size dryer to make sure it functions properly so you will need to install a new dryer to convert R12 to R134a. The last piece of your system that you’ll need to change is the pressure ports to convert R12 to R134a. R134a uses different ports to charge the system and to measure pressures so the old R12 ports need to be removed and replaced or retrofitted with adapters. Once you’ve got all the new equipment in place it’s time to evacuate your system to draw a vacuum and also to remove any old refrigerant and old oil. When installing the new refrigerant, you need to also add R134a compatible PAG oil to keep the compressor lubricated. After you have converted your system from R12 to R134a it’s important to check the pressures in the system for a few days to make sure everything is working properly. If you noticed any slight leaks in your system after the first few days of use, use Red Angel A/C Stop Leak to seal to leak in your system and keep things cool! For more information about Red Angel A/C Stop Leak, click on the banner below!